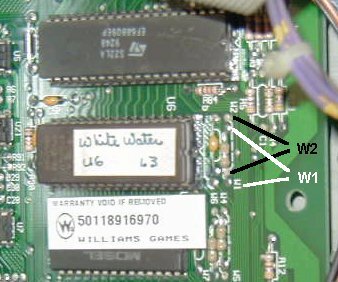 Both of these jumpers are located to the right of the U6 game ROM chip, when looking at the board as mounted in the backbox (see image below). A jumper is basically just a wire that connects two points on the board. The points are labeled on the PC board- label is usually located inbetween the two points, or dotted lines will outline the two points as labeled. The jumper may be just a simple bare wire, or a wire with white ceramic around the middle of it, or may look like a resistor. A connection between either set of two points is considered "IN", or "set". A set of two points that doesn't have a connection between them, is considered "OUT", or "not set". To change jumper settings, you'll need a soldering iron, some solder, de-soldering wick (or "braid"), or a de-soldering tool, and possibly a small piece of wire to use as a jumper. Use care when desoldering and soldering on these fragile circuit boards- too much heat from a soldering iron can lift solder pads and traces, and can damage the board. Excess solder can short the jumper to other connections nearby. Just use common sense. If you're uncomfortable doing this kind of work, we recommend leaving it to someone who is experienced. If you know which jumper needs to be set or removed, and don't know a local electronics technician, try taking the board to a local TV/VCR repair shop- they can do the work in a minute or two and may only charge $5 or $10.